I own a pair of Crucial M4 256 GB SSDs. One of them, my boot drive, has caused me no end of trouble recently! Sometimes, after rebooting, the SSD isn’t detected by the BIOS. This seems to be linked to the 010G firmware, which has caused a lot of complaints! So far, I have found two ways to recover from this lockup. This apparently does some sort of internal reset. The timings don’t seem to need to be exact – I’ve done it with 30 minutes on power each time before and it worked. Sometimes the SSD is just slow to be detected by the controller. After a few minutes, though, it’s ready. By restarting the computer without interrupting the power (which is what the reset button does) we’re able to get the SSD online and also have it available before the controller times out. Magic! There’s new firmware out now that should solve this issue once and for all. Once I’ve finished backing up my computer I will update to 040H and see if it works. I’ll let you know! I was all geared up to buy a Nexus 7 after Christmas. By pooling my birthday money and Christmas money, I figured that I could afford a treat. I’m not going to do that now, though. Here’s why. I pay tax. The government take a large cut of everything I earn. They use it to fund hospitals, universities, schools, roads, railways and the military. I don’t like everything they spend it on, but I don’t have a choice. Whether you’re a business or an individual, you pay tax. There are pays of avoiding it, of course, but only the extremely wealthy can afford to do this. That’s right, the ones who should be contributing the most are the only ones getting out of it. So much for ‘don’t be evil’ – Google think they’re above the rest of us. You operate and profit in my country but don’t pay for the public services that you use. In return, I’m not going to buy your shiny new products. You can’t complain, Eric – it’s just capitalism, isn’t it? I always forget this, so I’m going to write it here for future reference. To increase the heap size, edit /etc/defaults/tomcat7 – this is where the JAVA_OPTS variable is defined. I bike to work every morning. I bike home every evening. As I pedal through the fog and rain, I think about happier things. I think about writing. I’m not sure how many half-articles I have in my mind right now. A rough count puts the number at way over ten. I need to start writing these down. Typing them into the Internet. I need to… but I don’t. I think about them twice daily, and then forget about them when I get home. Let’s see if I can change this (ahem) cycle of not blogging. Windows Vista and Windows 7 have a feature called UAC, which stands for User Account Control. It’s a good idea – programs can’t touch certain files or take certain actions unless you, the user, explicitly grant them administrative privileges. Sounds useful! 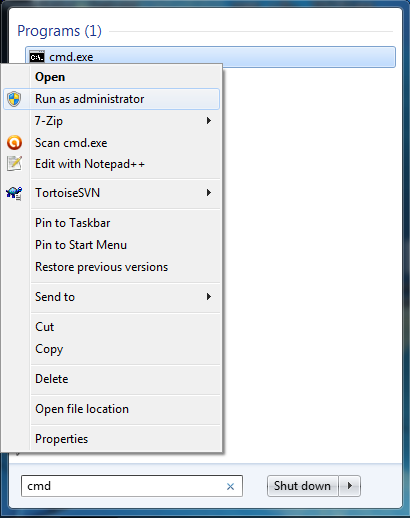 That’s: Start -> type “cmd” -> right click -> Run as administrator. Easy.